I am just back from a wonderful holiday in Thailand. It is a beautiful country with a fascinating history and culture -- so much to see, I am already planning to go back. One of the mail attractions for me was the food, from a quick street corner snack to elaborate luxury meals by moonlight right on the beach. Because I am in love with Thai food, I decided to enroll in a cooking class. And what a great idea it turned out to be! 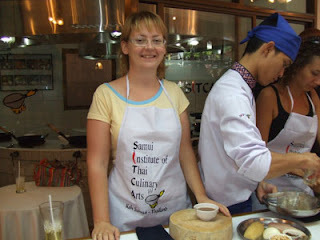 Before I even left home, surfing for info on the island of Koh Samui, I came across the Samui Institute of Thai Culinary Arts. The institute has been featured on both BBC and Globe Trecker, so I had no doubts about singing up for an afternoon class. Ten people attended the class -- that's the maximum capacity of the institute. Upon arriving, we all received an apron (pictured) and a binder containing the recipes for the evening:massaman curry paste, massaman curry with chicken and potatoes, spicy King prawn salad, and pumpkin coconut milk soup with fish balls. The recipes were accompanied by step-by-step photos. We all took notes as our instructor presented the recipes. She showed us the different ingredients needed, likegalangal , tamarind, palm sugar, and fish sauce. Then she taught us how to prepare the ingredients -- how to soften hard palm sugar, how to extract the juice from tamarind pulp, how to choose and chop chilies for your need (more on this in another post). We each had a cutting board and a cleaver. Now assistants brought us individual platters with ingredients for each of the courses. While our instructor showed us the process, gave us tips and answered questions, we sliced, chopped, mixed, and pounded. In an hour everything was ready for cooking and we were awarded with a little break. 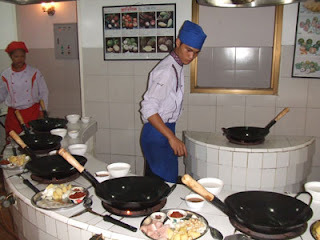 The cooking took place in a special teaching kitchen where we were placed in a semi circle, each with our own wok, facing the instructor in the middle (pictured). The assistants brought us the platters with the ingredients we had prepared and then we cooked them, watching her demonstration and receiving a helping hand from the assistants. The cooking was a lot of fun and was done quickly. The resulting dishes looked like the real thing -- pretty and colorful. When the class was finished, we had a feast! We had each cooked for two, so now we cloud invite a guest to come and taste our three course home made Thai dinner. In the institute's dining room we had a great little party, tasting theresults of our labours and commenting to each other on the colors, textures and tastes. Now that I'm home again, I am already cooking Thai dishes, improvising and having a great time. This is the first time I take a cooking class on my travels, but definitely no the last! The Traveller's Kitchen has a directory of cooking classes around the world. Some of the culinary schools offer the best cooking programs such as culinary cooking training schools it has many professional and culinary certified instructors to teach their students. The also offer many beneficial programs like financial aid, tuition, student culinary trip etc.